Cavendish Devere is a carpet supply and fitting company covering South East England. 3 office staff and 5 fitters with regular use of contractors for bigger projects. Hughie Condon is the Operations Manager. The main problem I had was managing estimates and quotes. We do around 240 quotes a month and that is a lot. All done on word and we have a template we copy and paste and then email to the customer. They come back by email and we have so many we've forgotten about some that never came back to us. We were losing a lot of quotes to competitors because we lost quotes or we didn't get back to the customer in time. Also then getting the fitter to the job and organising him. We had white boards in the office we the daily plan of the fitter, one each. But things did go wrong a lot of the time and we'd have an unhappy customer! 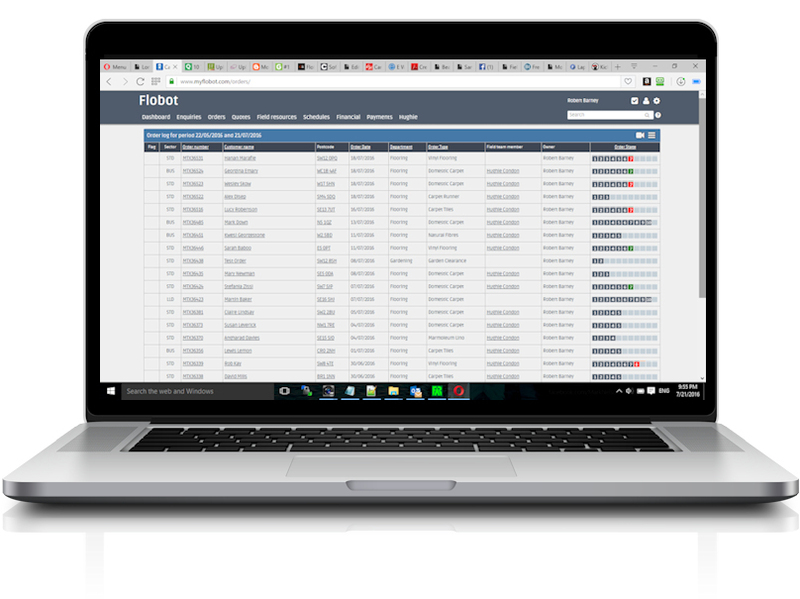 We installed Flobot in no time but because Hughie and his team were coming from a low-tech environment, we earmarked 2 days to get them up to speed with the system. Hughie was adamant that his fitters wouldn't work with the app - they didn't even have smart phones! No problem, we told him. Flobot can work even with an old Nokia! We created great new templates for his invoices and quotations and went through how to create estimates, how the contractors could create them and of course the enquiry handling. By the end of it, everyone was up to speed and the office team were taking client details into Flobot straight away. I was amazed at how quickly the girls picked it up. All of the quotes were in one place and we took someone on just to chase the quotes up. It has been massive. We've been doing so many more jobs I have had to take one of the contractors on full-time. This is off the quotes. The other thing is that the fitters have stared using the app too, so now we know where they are all the time! It's really great to see what an impact Flobot has had on Hughie's business - and he really is only using a fraction of what it's capable of. But if he's happy, we're happy! Northcote Property Services is a small property maintenance and refurbishment company in South West London. Employing 2 office staff, 2 full-time tradesmen and 5 contractors, they provide building, refurbishment, painting and decorating, tree surgery, gardening and landscaping services - among others! Jon Brierly is the owner. Because I am out of the office so often I come back to the office to a lot of paperwork. Jill, my admin assistant, has her hands full answering telephone calls, replying to emails and then if the jobs go ahead, with scheduling contractors and tradespeople. We were using Google Calendar to book people in, A chip and pin machine for quick jobs like a handyman and Microsoft Office for sending out quotes. It was getting too much to manage. Lots of different bits and pieces and then getting them matched up of the end of the month meant that I had to take days off work and work late into the night. It was pretty simple to set Jon up onto Flobot. We replaced his chip and pin machine with Flobot's merchant services terminal which saved him £25 per month. Then we trained Jon and Jill on Flobot in less than a day. We showed them how to use the app and installed it on all their employees and contractors smart phones and onto Jon's tablet. Finally, we created a lovely new quotation template for them, so the quotes look great. 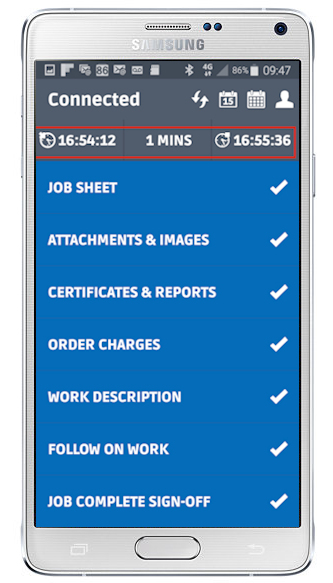 Apart from getting a book-keeper, getting Flobot has been the best business decision I've made so far. I would say I'm winning 20 to 30% more quotes not just because they look better but more importantly, I can manage them - even when I'm on a job. A quick call to the customer pays dividends. I've got no outstanding payments on Handyman jobs, because I can take payment in the office or at someone's premises and I've got hardly any paperwork. In fact, I would say I'm actually working less and the time I'm at work is just way more productive because I'm organised. And Jill loves it! Working with Jon was one of the most satisfying implementations we've had. Jon's got a great business and because it's so varied it really uses all the features and capabilities that Flobot has to offer. And because Jon was so disorganised before (sorry Jon! ), we knew how much impact Flobot would have on a day to day business. We're chuffed to bits for him and we're looking forward to adding even more powerful capabilities to make his life even easier!